Mano Menezes’ first competitive game as Brazil manager ended with a poor 0-0 draw against a resilient Venezuela side. Menezes played his expected side, which meant Ganso playing as the playmaker behind a front three. Cesar Farias named a solid 4-4-2 side, with La Liga duo Nicolas Fedor and Jose Rondon upfront. Brazil dominated possession, of course, and in the first ten minutes of the game looked like they were going to run riot. The longer Venezuela went without conceding, however, the more confidence the underdogs had, and the better they defended. The match started at a much higher tempo than many of the Copa matches so far. Brazil looked to press from the front early on, whilst Venezuela closed down in the midfield, in a 4-4-2 system that became 4-2-2-2 when they won the ball. Venezuela’s commitment to closing down got them into difficulties within the first ten minutes. Their two central midfielders, Franklin Lucena and Tomas Rincon, looked to pressurise Ramires and Lucas, but this simply left a yawning gap between their defence and midfield, which left Ganso in oceans of space. Brazil easily worked a 4 v 4 with Ganso on the ball after a few minutes, although they didn’t take advantage of the situation. As we’ve seen before, most notably with Australia’s disastrous tactics against Germany in their opening World Cup game last year, closing down in midfield is suicidal if you have a numerical disadvantage in that zone. Unlike Pim Verbeek in that Australia v Germany game, Farias understood the situation here and told his two central midfielders to sit deep. The wide players joined them, and the whole Venezuela side played behind the ball and made it difficult for Brazil to play through them. Brazil frequently looked like a broken team, with Ganso too high up the pitch close to the front three, rather than playing as the link man in midfield. The two central midfielders struggled for an available man to pass to, and Brazil’s dominance of possession wasn’t turned into chances. The best bet looked to be when the full-backs became involved, as the Venezuela wide midfielders often got drawn into the centre of the pitch, but they produced little on the ball. The man who tried to connect the defensive ’six’ and the attacking ‘four’ with his typical energetic running was Ramires, but when he moved forward this left Lucas exposed in front of the defence (a little like Javier Mascherano in last summer’s World Cup), and Venezuela’s counters looked dangerous. Lucas was forced into two tactical fouls to stop breaks, and was fortunate to escape without a caution. The first half pattern continued after half time. Venezuela got stronger at the back and actually looked more dangerous going forward – with the wide players coming narrow and making a 4-2-2-2, quick forward passes were always an option. They also dropped Fedor deeper, around Lucas, to help out in midfield. Brazil continued to suffer from having a broken team in midfield, and long diagonal balls for Pato increasingly became their strategy. He controlled a couple of them well but Venzuela’s centre-backs positioned themselves intelligently, with Oswaldo Vizcarrondo particularly impressive. 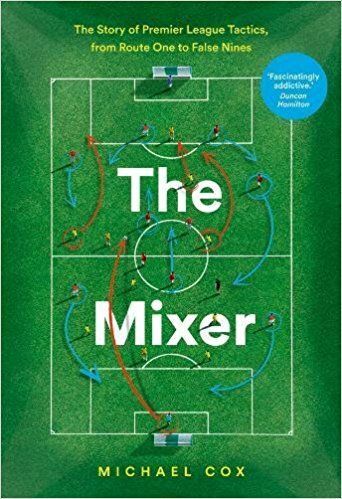 Brazil brought on attacking substitutes – Elano, Lucas and Fred – and sometimes looked more like their 4-2-2-2 than their 4-2-1-3, but they had no cohesion in attacking zones and were relying on an individual moment of magic that never arrived. Another underwhelming Copa game, with the underdogs able to shut out the favourites with relatively unspectacular tactics. Brazil were poor in the final third and Menezes needs to work on the problems with a lack of compactness, but Brazil weren’t terrible. Unlike with Argentina, the shape and structure of the side seems OK, they just need some fine-tuning and some cohesion upfront. Funny how Alves was the only player trying to dictate play, when the rest of the team were virtually broken up. I was surprised that ZM didn’t comment on this, though I imagine Alves’ attacking forays are pretty standard fare for whatever team he’s in. Very true. Brazil’s problems are not serious at all, unlike Argentina’s. Within a couple of matches they should be able to sort it down. At least, they have the best defence in the tournament. Do you honestly think that Paraguay and Ecuador will play worse than Venezuela? Both these teams are more rugged and more savvy than the Venezuelans. I think Brazil will end up drawing their remaining games and will not get through to the second phase. Does anyone think that Brazil might be better off switching Pato and Robinho about? Robinho has all the attributes to be a reasonably effective false 9, while Pato’s pace and dribbling would surely be more effective if he was moving in from the right between fullback and centre back. the false nine tactic is soooo hype now it’s incredible !!!! possibly but ‘false 9’s in international football are a big risk because they require a lot more understanding amongst the players available. Ganso would also have to play much deeper (as has already been hinted by just about everyone) if space is to open up. Even Pato can play as a tevez/rooney type false 9 who moves abou the pitch horizontally as much as vertically to drag defenders around rather than the Messi type player who drops deep into a #10 position. Hence why i said he could play from the right, my suggestion was more a way of getting the best out of Pato and Neymar while still fitting Robinho in, I don’t even think Robinho is that good. Only saw the second half but Brazil seemed a bit slow and a bit laboured. Venezuela played very well, they had two well organised banks of four when defending though as said, the wide players were a bit higher but they were also very quick in tranisition from defence into attack and having the two front men high up the pitch even when defending helped them a lot. It gave them two players to pivot off and allowed them to push Brazil back further than they would have liked to been. Brazil suffered from a lack of dynamic play out wide and no efficiency in stretching Venezuela. The wide players, even the full backs, cut inside and left them a bit congested in the middle and Venezuela could just sit deep and compact and they then didn’t have to work as hard. I think brazil’s main problem is the defense/offense balance: they need alves and andré santos upfront to widen the field but they also need them to defend with pato, robinho, neymar and ganso practicaly not defending. On the sheet we see that if brazil lose possession with their fullbacks high on the pitch venezuela can easily play a 6vs4. Another problem for Brazil is the lack of a truly good number 9. Brazil has not had a truly lethal out and out striker for some time, not since the days of Ronaldo. This is one of their problems in my opinion. Pato is decent but is not your classic #9 striker. He is more a winger. Fred is just not good enough, and really doesn’t bring much to the table other than some presence and height up front. I would say Pato is like a winger at all. He is best when he gets the ball right at the edge of the area near the center of the pitch, as from there he can use his skill and speed to get right into a goalscoring position. He loses the ball often/doesn’t advance it well when he’s coming from the wing (AC Milan has had this problem in a big way when Pato and Ibra are both playing). Dunga was bashed in Brazil for playing defensive players and counter attacking football, but Mano Menezes’ supposedly more attacking side simply can’t score lately, going 4 of the last 6 games without finding the net. I don’t think Robinho works well on the right in this system. He was keen to come to the middle, right into Venezuela’s narrow defense, rarely providing a wide option because there was nobody to play with on his side. On the second half Dani Alves was also trying to help the outnumbered middle, and the width was further sacrificed. Brazil has yet to deal with packed teams. I would like to see how Hernanes would do here in this situation on the right, teaming up with Ganso, but since he’s not an option I’d try Lucas Silva or Elano in for Robinho. The current line-up and tactics should work better against more open teams, we’ll see. There are many things I would change with the lineup. It is great that the coach has trust in his young players, but he is now playing a major tournament, and he has to play his best current players. Neymar has all the talent to become great, but at this very moment, he is no better a winger than even Adriano. And I am a big admirer of Ganso, but he suffered two very long-term injuries this past season, and he has only played one game for Brazil prior to this one. I would probably completely change the players in midfield and attack. Ramires and Lucas are good players, but Brazil can have a higher quality partnership in Sandro-Hernanes (crazy how he isn’t in the squad). As for replacing Ganso, again, there really isn’t anyone in the squad. But at this very moment, I would pick a whole bunch of more experienced reliable attacking midfielders ahead of him. Not necessarily more talented players, but better at this moment like Fernandinho, Carlos Eduardo, even Ronaldinho and Anderson. The defense doesn’t need to change, especially if the current defense is the most coherent, but I would replace Lucio with David Luiz and Andre Santos with Marcelo. Marcelo can add much more to the attack than Andre, and is probably just as reliable defensively. I know Robinho is one of Brazil’s leaders, but he isn’t that good. I put Hulk in the starting 11 over him on the RW. I would put Nilmar in the starting 11 as well ahead of Neymar, and put Pato on the LW. Or even put Adriano on the LW, and then decide who would be the defender and attacker between Marcelo and Adriano on the left side of the field. Brazil is good right now, but they are far away from their best starting 11. There really isn’t another way to let the fullbacks get as far forward as they need to then have Thiago Silva in midfield. It also takes advantage of Brazil’s depth at center back but lack of a quality holder. Pato and Neymar can come off the flanks and create problems for any back line and Robinho can play as a withdrawn center forward or switch with the outside players.Ramires would be able to get forward more with SIlva holding and Ganso could play deeper where he could get the ball with time to turn. I don’t understand this myth that Lucas isn’t a quality holder. He was far and away the player of the season for the team that finished 6th in the PL, and is just about the only non-CB in the Brazil team that doesn’t think his job is to play a killer pass every time he touches it. Also, Brazil has had problems scoring, but everyone can see that they have the tightest defense in the Copa. Do you think Lucas has nothing to do with that? Also, I don’t think Ramires’ problem was that he wasn’t getting forward enough (and it’s not like Silva is going to sit much deeper or be more mobile than Lucas anyway), but that he’s not creative enough on the ball. That said, I think he’s a really good player and have no problem with him as the “2nd function” midfielder. They just need Ganso (as many others have said) to actually play in midfield. I don’t even know why Brazil would even play a holding midfielder, let alone two, against teams who park the bus. I think Mano is incompetent and cowardly for doing so. What Brazil needs is a player in the middle who can create and put his foot in when needed. I think Sandro would help them out if he were to play there. With regards to Lucas and finding the killer pass, just look at all the clubs who finished above Liverpool this season. They all use a holding/creative hybrid who not only defends but distributes the ball well and can carry the ball forward. It says a lot about Lucas that he can’t do either well. “they all use a creative hybrid who not only defends but distributes the ball well and can carry the ball forward” Sorry but i disagree. What your describing is the job of two players in the modern game, you can’t tell me that there is a player out there that can tackle and distribute to a world class level, this kind of player doesn’t exist in the modern game. Look at the way the liverpool team of a few years back when there was the combination of mascherano (world class destroyer) xabi alonso (world class distributer). Both have subsequently been sold for huge fees. The Spain side of the last world cup also had a similar idea with xabi alonso and busquets. Secondarily not every team needs a double pivot midfield system to draw creation from. Look at the champions league winning team of Internazionale, they had thiago motta and esteban cambiasso(i think?) in deep midfield and i don’t think you could argue a case for either being a particularly creative presense in the middle of midfield. the creation was left to wesley sneijder, surely brazil have enough creativity at the disposal in the attacking midfield region to play without a deep lying playmaker, and also is a deep lying creative role suited to braizlian players with flair? i think not! If you look at Lucas statistics last season its clear to see that he is a class act, he retention of pocession is excellent as is the number of sucessful tackles and interceptions he clocks up during a game, he is a class act and Liverpool miss him when he doesn’t play. I think he is the stereotypical underrated holding midfielder, no big crunching tackles and no killer passes, but quitely goes about fulfilling his role efficiently. Mano Menezes faith in him proves this along with every other manager whom Lucas has worked under! So what you’re telling me is that Nigel De Jong is secretly a dribbling, long-passing dynamo, and I have just missed it all these years? And Jon Obi Mikel as well? And I don’t know where you got the idea that Sandro is creative. Yeah, he’s powerful and can hit the ball really hard, but that doesn’t make you a creative player. What you’re describing is only even half-true of Carrick (passing), Song (carrying the ball forward) and Essien (both). The problem is that A) Carrick, when not in great form, doesn’t have the tackling ability to be the sole holder, which Lucas does and B) Song and Essien, when played in the deepest role, leave far too much space between the lines because they’re not actually holding midfielders. So, I’m going to have to disagree that a strong-tackling, durable, positionally excellent holding MF who has a great engine and never loses possession isn’t a very good player, and plenty good enough to start for Brazil. Very true. Brazil, despite playing not as well as they should, are still a football team, rather than a collection of excellent forwards that parades itself under the name of Argentina. Alves seemed to get too narrow at times I thought. he is too accustom to Barca. Do you think the reason Ganso kept pushing too far forward was due to Ramires doing the same thing which forced the strikers wider and massively reducing Alves and Santos influence in the game. If they switch to a more conventional 4-2-3-1 they could make more use of the space in the wider areas and Alves could play a more natural role? Additionally, I would have liked to see Leandro Damiao brought to the Copa, his threat in the air might have provided a vital extra dimension against Venezuela. I spent a long time trying to guess in which team did that “Nicolas Fedor” guy played in La Liga. It’s obviously his actual name, but everyone here calls him Miku. It looks to me like Menezes is looking for a way to field all 4 of Pato, Neymar, Robinho and Ganso, so he winds up with the current shape. These 4 shouldn’t be played simultaneously. The problem is their defensive product is terrible. Best bet would be a 4-2-2-2, with an inclined square. Up top play 2 of Pato, Neymar, Robinho, Nilmar, or Hulk. Have the front two make divergent runs off the ball, in the classically Brazilian style, to stretch the defense and occupy 4 defenders with two attackers. In the back I’d replace Santos with Marcelo and keep the other three the same. Bringing in Luiz and pushing Silva up as a holder, as mentioned above, would be an interesting alternate and be the easiest way to play a first function volante who drops into the back line. The midfield should have one of two configurations depending on the opponent. Against less technically skilled teams who are going to pack the defense play with a first function Lucas Leiva or Sandro (or even Thiago Silva), a second function of Ramires, third function of Elano (for a second playmaker and someone to spread right) or Anderson (for added mobility and forward runs), and Ganso at the tip of the spear. 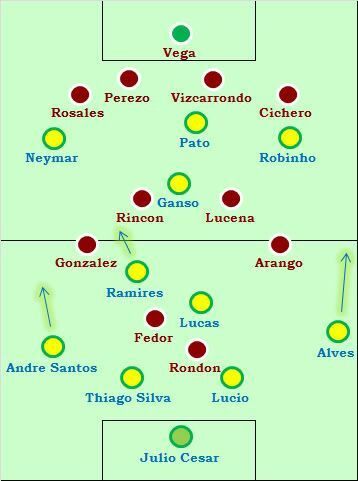 Not unlike Santos, or even a less destructive version of Dunga’s shape if the forwards wind up leaning left. Against tougher opposition play a midfield three of Sandro, Hernanes, and Lucas Leiva with Ganso in the hole. Hernanes can dictate from deep, while Sandro and Leiva will be in positions to cover wide and defend counters. But this will require the two forwards to provide the width along with the fullbacks. To Europeans this might sound too narrow, but for Brazilians this would be natural. Hernanes wasn’t called up, Space Ghost. Yeah, doesn’t look like Menezes and I would agree much on squad selection. No wonder he won’t return my calls. Nor were Marcelo and Anderson. But they should have been. Brazil actually look like a good team, i would argue to replace only two players, with the main problem being lucas. I think he is actually a good holder defensively with great positioning, but his passing is very poor, and doesnt really create from deep which brazil needed today, someone to set the rhythm for the rest of the team. Next is pato upfront, who actually does the false nine role really well, but you need other options during games, basically a presence up front in the penalty area, even if its only the fullbacks crossing, but pato really doesnt offer that. Also to be able to hold up the ball for the two wide players to get into good positions, and pato definitely doesnt do that. Brazil dont really have those players right now, maybe hernanes could have been an option instead of lucas, but there really isnt a decent striker option. Ha! I thought Pato and Lucas were easily the best front 6 Brazilian players. I guess people really see different things. Calling Lucas’ passing “very poor” is a major exaggeration, though you’re of course right that he’s not a creator. But surely Brazil needs at least one midfielder who’s job is to keep the ball moving rather than create, and it’d be more useful to put a passer in Ramires’ role. There’s no one on the bench who can hold and pass better than Lucas anyway, and the only passing option to replace Ramires is Elano, who’s not really a deep-lying player either. Actually reading that again I did exaggerate Lucas is great at keeping the ball moving, I just think for a team like Brazil they need a deep lying playmaker (Pirlo-ish) and I think Hernanes could probably do that role, and especially against a team like Venezuela I thought it would have been worth a try. Ramires could provide the energy and tackling that would suit this midfield partnership. But seeing as hernanes isnt in the squad then there isnt really an option i would agree, was more lamenting the coach’s decision regarding his squad which i beleive he made a lot of mistakes about and I am not too sure about him as Brazils coach, seems to have stuck to a easy formation with standard roles for every player, not very inventive and easily stopped as seen today and in a few games before this. Regarding Pato i was trying to say he actually had really great movement in the match and was one of the brightest players yes, but he needed to hold up the ball more i thought and let the wide players make inside runs off him, but he hasnt really got the build for that and also isnt very good in the air, i would actually prefer him on the wing where he could get on the ball and run at defenders/ make runs into the penalty area. But as i said Brazil dont have a good stiker that can lead the line, and it shows in the lack of goals i believe. So given his squad (poorly picked) there really isnt much option than to go for the same side really. Not only Hulk and Marcelo, but Nilmar, Hernanes, Kaka and Ronaldinho weren’t called up either. I suppose people are saying who they would call up and field if they were in charge. Brazil has such a wealth of footballing talent they can leave behind more than a few good players and still have a great team. It’s interesting that the top 3 teams in the Copa have all had underwhelming draws. Brazil failing to score and Argentina and Uruguay having to chase the game after being down. Paraguay / Ecuador had a goaless draw, and Colombia’s 1-0 win over 10 of Costa Rica’s B team is hardly impressive. Chile at least scored twice, but they were up against Mexico’s B team… All in all, no team has really convinced. its just the first game, but the top 3 candidates all seem to have reasonable problems that could be solved during the tournament. Brazil need a passer, a 10 with game experience & a finisher. Ganso is wonderful, but for all his obvious talent, hardly anyone can play 1 international and be expected to perform like a veteran on his second. Pato has performed best when playing off someone. moreover, Pato can play on the right, thus allowing Neymar to dominate his preferred left flank. Robinho hasn’t put up a fight for the shirt since 2007. Ramires, with all due respect, is not the best option to play the way Mano has promised/advertised Brazil will play. no one has performed exceptionally well in this position since Ze Roberto partnered Emerson in te middle. and its not like Brazil dont have players, which is the annoying part! Ganso may had lots of space in the first minutes, but Venezuela rapidly settled for a shape they kept for the majority of the game: two very deep, compact and narrow banks of four. The centre of the pitch was packed with players, and one of Brazil’s main problems was that they were narrowing too much the play. Nothing better than stretching the game to open up defences, but Neymar/Robinho were often tucking in and Alves/Santos rarely seemed to really go forward to widen up things. I do agree that Ganso really found himself too high up the pitch to dictate play the way he’s used to be. I don’t know if the constant forward runs from Ramires had to do with it, but it seems logical (considering the front four is not much different from the superb 2010 Santos side, so the problem wasn’t in front, but behind him). His magic was still there, though, as we could watch at least couple of great killer passes from him. Remember that this was only his second cap. With more games and more understanding between the front four, he can do much better. Strangely, when defending, Brazil looked much more of a 4-2-3-1 in a very European fashion rather than 4-2-1-3 – which is very strange, considering that South American (especially Brazilian) versions of 4-2-3-1 look very different from their European counterparts. Considering Mano Menezes wanted his team to perform an intense pressure marking (a little like Barcelona do), I thought Neymar and Robinho would retain their advanced positions and aggressively mark the Venezuela full-backs. Instead, they were more keen to join Ganso in a 3-men line. 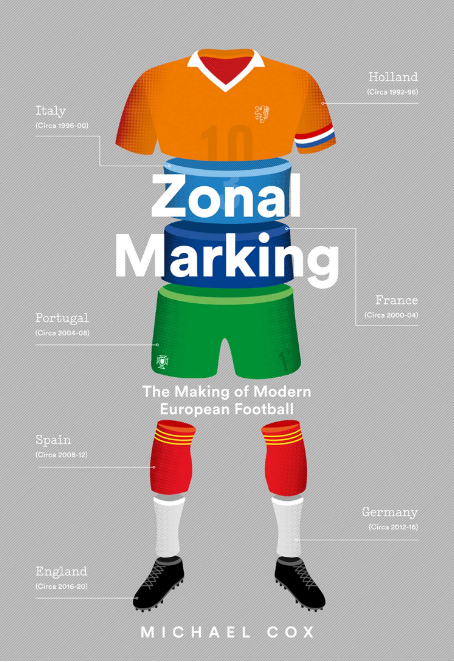 People claim that they are very poor when marking, but whether they did a good job or not, they were willing to move deeper and mark, which is kinda weird considering they were never that disciplined defensively. Another point to notice: it’s very very usual for Brazilian players to switch positions when attacking, as this would work pretty well against a so compact side like Venezuela. Instead, both Neymar and Robinho were much more steady on their respective initial sides. This is another thing to change for future games. I think Pato would really function better coming from the wing, but that’d mean that Fred would need to be pitched upfront. As much as I like him, I don’t think he’s good enough currently to be on the team (Leandro Damião would fit better on his place, and I’m also missing Nilmar and Hulk on the squad though this is another discussion). And considering Pato was probably Brazil’s best man on pitch, I can’t see the point on making him change his positioning. I’m also missing, like many of you people, a player in midfield who could create from deep. Hernanes would probably be the man for the job, but he was unfortunately not called. I think his unlucky dismissal against France decreased his chances with Mano. Technically, I do agree with you all. He’s by far the best Brazilian left-back at the moment, but his “non-calling” comes from other reasons. It seems that he’s simply not willing to join the national side. Dunga called him up a few times, only to change his mind and never calling him up again. Mano also wanted him to be on his team, but when Marcelo was called up, he declined claiming that he was injured (or still recovering from injury). Interestingly, he was enough fit to be part in trainings and games for Madrid in the near days. Also, there’s a story of him sending an e-mail to a colleague saying how easy it was for him to decline a calling for the national side. Unfortunately for him, this e-mail was sent by mistake for the Brazilian coaching staff, as well. I don’t think Mano is ever going to call him up again. Marcelo never seemed willing to join the team anyway. To conclude this long comment, I’d like to remember people that this is almost the same side that played so well against USA in Mano’s first game on charge (with the exception of Júlio César and Lucio). Paraguay and Ecuador aren’t likely to play the same way Venezuela did, so we can expect more open games where this formation will probably work better. Brazil still need, though, to find solutions when facing compact defences. This looks like he’s trying to copy the Inter of Benitez.